BLOG – Page 2 – Have You Met Matt? And an album that came out in November 2011 that is one of my favourite albums ever! So here’s my list of my favourite films of this year, I have not seen as many as I would have liked and am especially disappointed I did not get to see The Master at the cinema. Out of knowhere and with some of the best fight sequences I have ever seen this was something a bit different and makes me so excited to see what the director Gareth Edwards will do next. Popcorn blockbuster at it’s best, I am a massive Marvel/Avengers/Joss Whedon fan anyway and this lived up to my hopes. The Hulk was a revelation in effects and comedy value and all the main stars put in great performances. Again, I had high hopes for this and Rian Johnson directs another sophisticated and interesting film. Joseph Gordan Levitt is getting better and better and does a spot on version of Bruce Willis without making it look like an impression. Gritty, violent and brutal all at the same time, really enjoyable film with a great (true) Robin Hood-ish story, not giving to the poor but standing up to a corrupt government, Tom Hardy is immense and Shia Lebouf is charming. Guy pearce is sometimes a littel pantomimy but this does not take away from a great film. Wes Anderson, one of my favourite directors works wonders with child actors and makes another sweet, stylish and beautiful film. Was sure about this at the time as it thinks it’s a little cleverer than it actually is, but I think it will definitely gain a big cult following and again Joss Whedon adding some of his magic to it. Some great gory horror sequences and some hilarious banter between Bradley Whitford and Richard Jenkins makes this Scream for the new Millennium. Making a found footage film new and origianl is getting harder and harder, but Chronicle is great. Taking the moral dilemma ‘What would you do if you got super powers?’ and running with it. the CG struggles a little at the end as the directors vision outgrows the relatively small budget but nice to see something a bit different. Not for everyone but a great looking documentary and live piece about the last few days of LCD Soundsystem. Probably helps that All My Friends is one of my favourite songs ever. Based on a true story this is a creepy study of how far humans will go when faced with an authorative voice on the other end of a telephone line. Doesn’t try too hard and with some decent and subtle performances, I couldn’t believe this really happens. A good comedy buddy movie with some unexpected funny moments and clever jokes based on adults as high schoolers, better than any other comedy this year. I suppose I should but this on here as it is a great film, just nowhere near as good as The Dark Knight. I’ve only seen it once and was massively disappointed but thinking back there were plenty of great sequences and Tom Hardy was great even though the sound design on his voice was atrocious. Great film let down by a few too many niggles. I keep meaning to update my blog with things that I think are interesting or recommendations of Films, music and TV but laziness always gets the better of me. Tonight I’m going to try again with recommendations of two programs that I discovered this year that I would highly recommend to anyone. Written by Aaron Sorkin, the genius behind The West Wing, Studio 60 on the Sunset Strip and The Social Network. The series takes place in a fictional American Network’s news centre. I love the way they work real life news stories into the world of these characters. It’s witty, poignant and sometimes a bit cheesy. It also features the classic Sorkin style of every character being able to talk at 1000 words per minute and rarely being lost for words. But that’s something I love about it. It garnered a lot of criticism from the media when it was released but mainly due to the fact that it was them being scrutinised for a change and being shown what an idealistic version of the news would look like. Anyway, if you like original, funny and intelligent drama look no further. Hopefully this will get picked up on terrestrial TV at some stage so everyone can enjoy. Trust me, this show is nothing like the first four episodes of the first season, they are dire, drab and highly forced, but all of a sudden, everything clicks and this show shows it’s funny side. Based in a community college and featuring what look like a clichéd bunch of misfits but are actually very intelligently written and often hilarious characters. Over it’s 3 (and counting) seasons the writers have become more confident in their style and the show has blossomed into one of my favourite comedies of all time. If you like arrested development, give it a try. It has also suffered a similar treatment at the hands of NBC as they drop it, cut seasons short and move it around schedules as they see fit. One of the standout things for me are the multiple references to pop culture such as the Goodfellas style episode and the now legendary paintball episodes directed by Fast & Furious director Justin Lin. Now if only NBC don’t cancel it…..SixSeasonsAndAMovie. The Boss! Music and other interests…. 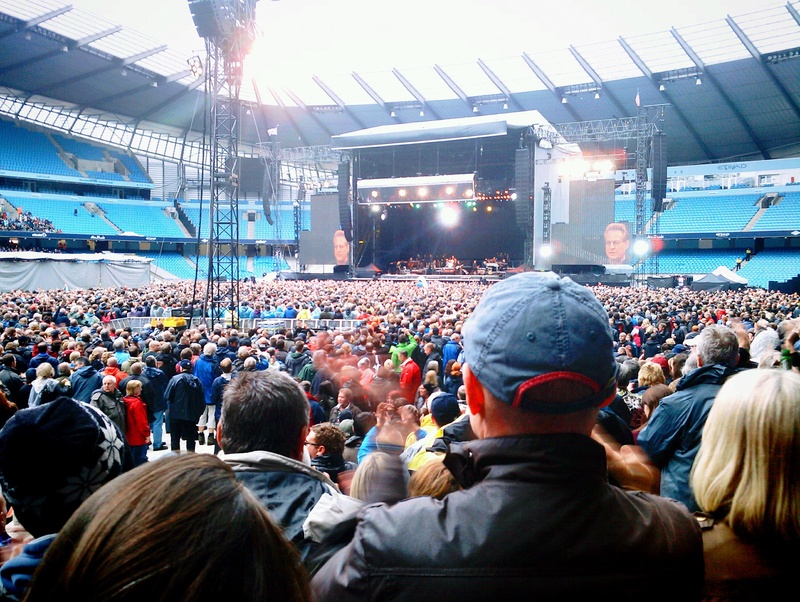 Been a busy couple of weeks culminating in seeing Bruce Springsteen at the Etihad Stadium in Manchester on Friday. It was incredible as always and by far one of the best live shows I have ever seen (much to Lucy’s disgust) he never has a support act and this time played for a whopping 3hrs 40mins. I took my Mum as a Christmas present and she loved every minute of it. Lucy and I are going to two thousand trees festival and I’ve been trying to listen to a lot of the bands playing and thanks to the wonders of spotify have heard a load of others too. May not be aimed at people my age, but it’s going to be great fun and hopefully sell loads with the Wii U. Really enjoying sitting watching the Euro’s while doing a bit of work and trying to get my portfolio sorted. Definitely enjoying the BBC more than ITV, can’t believe that such a big channel has such terrible designs and pundits. Worked at a call centre (which was nowhere near as horrible as I’d expected, the people there were lovely). Taken a contract back at FSG working on a cool new game. Driven thousands of miles between Manchester, Leamington Spa and Birmingham. Really gotten into gluten-free baking. Now I’m looking forward to the future at work and at home.